Download the manual for this game by locating the game on http://marketplace.xbox.com and selecting “See Game Manual". 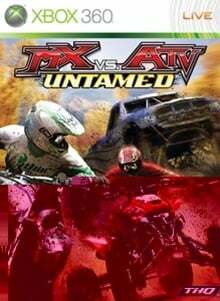 MX vs ATV Untamed kicks it up a notch and shifts into high gear as the best selling offroad franchise returns. Rainbow Studios has evolved their legendary Rhythm Racing™ engine to include throttle based power slides, near upside down whips and new scrubs. Compete in the first ever “X-Cross” tournament, which brings 8 unique racing series and crosses them into one ultimate offroad championship. Players can take control of the new ORV Sport and other vehicles, including Monster and Trophy Trucks, as they blaze through massive environments to determine which vehicle owns the offroad. There are no refunds for this item. For more information, see www.xbox.com/live/accounts.